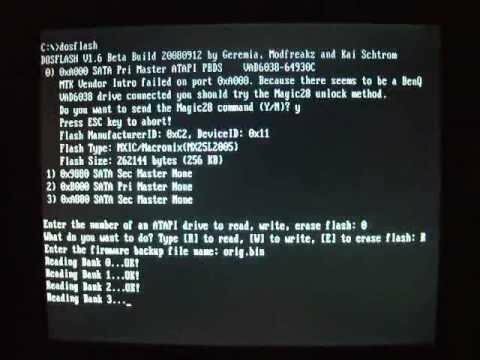 startup DosFlash will choose the most common and stable settings. first run. If you enable it the checked state is saved to the ini file. "NFORCE FIX". This parameter should be set to 1 for NForce chipsets if you experience strange problems. In DosFlash32 and DosFlash64 we added a static control which shows if the NForce Fix is applied or not. the key for an XBOX360 drive. We use the same authentication method like the console to verify a key. like the key files exported by LiteOn Key functions. LiteOn drives V1 and V2. - The drive key of Maximus patched UART drives can be extracted by using the task "LiteOn Key V1 (DvdKey)"
patched drive firmware by Maximus. - LiteOn files are now extracted to a destination folder instead of prompting the user for every file name. - LiteOn key extraction tasks separated per drive version in "LiteOn Key V1 (DvdKey)", "LiteOn Key V2 (FreeKey)"
and "LiteOn Key V3 (Tarablinda)"
"LiteOn Key V3 (Tarablinda)". For read, write and erase of the flash simply use the standard functions. Pay attention that the "LiteOn Erase V1/V2" task is only available for older LiteOns and not for the Slim. You should use "Read Flash", "Write Flash" and "Erase Flash" for the Slim. "LiteOn Key V3 (Tarablinda)"
a dump of the XTRAM8000 area. This can differ in a few bytes from one dump to the next. with a patched firmware sector to retrieve the complete dump! - Extract drive key on a "PLDS DG-16D2S 74850C" over UART -> "LiteOn Key V1 (DvdKey)"
- Extract drive key on a "PLDS DG-16D2S 83850C" over SATA -> "LiteOn Key V2 (FreeKey)"
- Extract drive key on a "PLDS DG-16D4S 9504" over SATA -> "LiteOn Key V3 (Tarablinda)"
- Read firmware on a "PLDS DG-16D4S 9504" -> "Read Flash" this is considered risky! - Write firmware on a "PLDS DG-16D4S 9504" -> "Write Flash" this is considered risky! - Erase firmware on a "PLDS DG-16D4S 9504" -> "Erase Flash" this is considered risky! - Erase firmware on a "PLDS DG-16D2S 74850C" or a "PLDS DG-16D2S 83850C" -> "LiteOn Erase V1/V2"
- Read firmware on a "Samsung SH-D163C", "LG DH18NS40" or "LiteOn iHDS118" and a NForce motherboard -> "Read Flash"
- Write firmware on a "Samsung SH-D163C", "LG DH18NS40" or "LiteOn iHDS118" and a NForce motherboard -> "Write Flash"
- Erase firmware on a "Samsung SH-D163C", "LG DH18NS40" or "LiteOn iHDS118" and a NForce motherboard -> "Erase Flash"
SATA are considered V2. The new Slim is considered V3 but only firmware version 9504 is supported atm. is simply ignored and can have any value for the V2 drives. this check. You have the following 2 possibilities to do this. 2) Choose "Disable Driver Signature Enforcement"
"Run as administrator" > answer the message box with "Yes"
- go to "Start Menu" > "Control Panel" > "User Accounts and Family Safety" > "User Accounts"
- click on "Change User Account Control settings"
- set the slider bar to the lowest value (Never notify) > click "OK"
the used driver (portio32.sys or portio64.sys) > "OK" > "OK"
- start DSEO > click "Next" > "Yes" > choose "Enable Test Mode" > "Next" > "OK"
way can be used to sign every driver that doesn't run natively on Windows 7.
and their lightning like decryption speed! The following only applies to the new XBox360 LiteOn drive PLDS DG-16D2S 74850C. MTK Vendor Intro failed on port 0x????. Do you want to resend the command until the drive responds (Y/N)? - press 'N' for "No"
Do you want to resend the command until the drive responds? Respect to Geremia, Modfreakz, Podger, Redline99 and Tiros. Like a wise man said: "0x2E is the MTK Intro of Death"
The following only applies to drives with a locked BenQ flash. Do you want to send the Magic28 command? Thanks to Redline99 and Tiros for help and support. Thanks guys for the excellent team work! it contains a very good explanation by Iriez from XBS, thanks for that one! Thanks to Iriez, Jumba, Redline99 and Tiros for help and support. - DosFlash32 has one additional parameter, if you start it with the parameter "EnableDrives"
some soldering and cut traces. Many thanks to jumba for the great idea of BenQ polling! Join us on IRC efnet at the channel #dosflash for support. Many thanks to Jumba, Redline99, TeamModfreakz and Tiros for inspiration and help! will start in Auto mode. All drives and the corresponding flash chips are detected automatically. All numbers are intepreted as hex values! "DOSFLASH R 01F0 0 A0 1 4 C:\flash.bin"
"DOSFLASH E C000 1 A0 1 4 D8"
Many thanks to Dale Roberts and his Direct Port I/O driver giveio.sys!